There are some who argue that print is dead. I beg to differ! 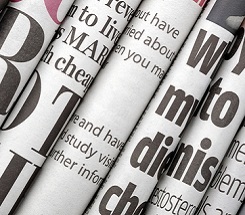 Despite shrinking advertising sponsors and the allure of online news, print journalism is alive and well, and very often available free of charge from your local newspaper publisher. For the teacher trying to steer away from worksheets, newspapers serve as a great hands-on resource that can enhance several cross-curricular lessons already in your plans. Even kindergartners can use a newspaper! Arm them with highlighters, and have them highlight all the high frequency words they can find. Have students cut out adjectives that describe themselves. Glue the words inside a “portrait” they’ve drawn of themselves on a piece of construction paper. Did you know that all good headlines have a verb in them? Have the children scan the headlines and find the verbs. It’s a struggle for students to identify a passage’s purpose– is it to inform, persuade or entertain? A newspaper is a minefield of articles written for all three purposes. Have students find informative news articles, persuasive editorials and entertaining cartoons and puzzles. Journalists know they have just a few seconds to capture the reader’s interest; they know the value of a good lead. In the classroom, we call this a hook and using a newspaper to learn about hooks is an exciting way to teach kids how important the first sentence is. Discuss types of hooks: anecdote, description, wow, riddle, quote, fact, question and the 5 W’s and H (AP lead.) Have students search their newspaper for the different types. Hint: look in the features sections—lifestyle, foods, or bring in a Sunday edition for more creative leads. Finally, have the kids write their own hooks. We don’t usually encourage kids to write a 5 W’s and H hook for their expository writing, but the truth is they are fun to write. Put the basic facts of a story on your Elmo and challenge your students to write the lead. The sooner students learn how to write dialogue the better! Stories are so much more fun when the characters talk to each other! On the Elmo, demonstrate the correct way to write dialogue. Then have the students choose a picture from the newspaper and write a short dialogue inspired by the photo. Where is the news taking place? Identify on a map where events reported in the newspaper are occurring. Use the newspaper’s ad inserts for creative math lessons. This is a good way to practice summarizing. Have the students choose a newspaper article and write a reader’s response. Have them write why they chose the article, summarize it, tell why it is important to the world and why it is important to them personally. Provide the real life experience of writing a persuasive paper by encouraging students to read the Letters to the Editor section, then write their own and submit them! Divide the class into groups and give each group a different newspaper (i.e. a local paper, a Wall Street Journal, a tabloid etc.) Have the students ‘dissect’ the newspapers. They should find: Masthead, section head, sidebar, headline, news article, editorial, infographic, political cartoon and advertisement. Have them arrange and label their findings on butcher paper and present to the class. Discuss the differences and the similarities. Newspapers are a natural fit for your advertising unit. Begin by writing the word “Demographics” on the board. Give the students a demographic description of your class, i.e. “Diverse suburban children aged 11-13.” Explain that advertising is based on demographics and so are newspapers. Have them explore the sections and write down the products being advertised in each section. See if they can find a connection between the type of section and the type of product. They should realize that it all has to do with the type of reader. Next, discuss the advertising techniques: bandwagon, comparison, humor, transfer, statistics, and celebrity testimonials. Divide the kids into groups and have them find ads using each technique. The most obvious use for the newspaper is to learn about current events! Give students time to read the paper and then quiz them on the day’s news. A good exercise in media literacy is to turn your students into fact-checkers. Is the news accurate? It should be. Have your students choose an article and research the facts. The uses for newspapers in a classroom are as varied as the news itself! Take advantage of this valuable resource—just make sure you have a large recycling bin!